For fantastic acoustics, a vibrant look, and improved LEED scores, it’s hard to beat the feeling of felt. Felt isn’t just the stuff of arts and crafts and Sunday school flannel boards. Whether it’s made from wool or polyester, felt is a material that can deliver a warm, textured look to your facility, while also improving your acoustics and LEED scores. Felt ceilings and walls are wonderful for sound absorption as felt products can achieve a Noise Reduction Coefficient (NRC) rating between .5 to .9 (with 1.0 being total absorption). 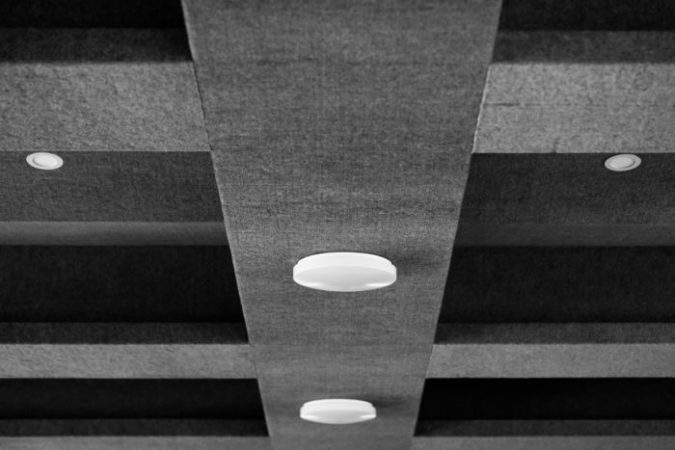 For ceilings, felt is a lightweight material that can easily be installed as a ceiling cloud, hanging baffles, or a full ceiling. Felt ceiling tiles, wall panels, baffles, decorative hangings, and floor coverings come in a variety of colors and styles, and can add a visual pop to your facility. Plus, felt is sustainable. Felt systems, when applied as part of an overall building plan for new and renovation construction, may contribute to LEED BD+C and ID+C certification for schools, retail, hospitality, healthcare, and commercial interiors. Wool felt contributes to LEED© MR Credit 6: Rapidly Renewable Materials (one year harvest cycle). There are two main players in the felt field. Hunter Douglas uses polyester for their HeartFelt modular ceiling panels, which are GREENGUARD Gold Certified, and Cradle to Cradle Certified™ Bronze. The product won a 2017 Best of the Best award in the category of Product Design from the Red Dot Institute. FilzFelt carries German-milled 100% Wool Design Felt. Their felt is 100% VOC free, with no chemical irritants, and is Oeko-Tex© Standard 100 Certified Product Class II. They offer a variety of products, colors, and customizations used by aquariums, hospitals, restaurants and companies including LinkedIn, Cisco, Square and Bank of America. For more information on unique ceiling and acoustic solutions for your facility, contact Vanguard Resources.